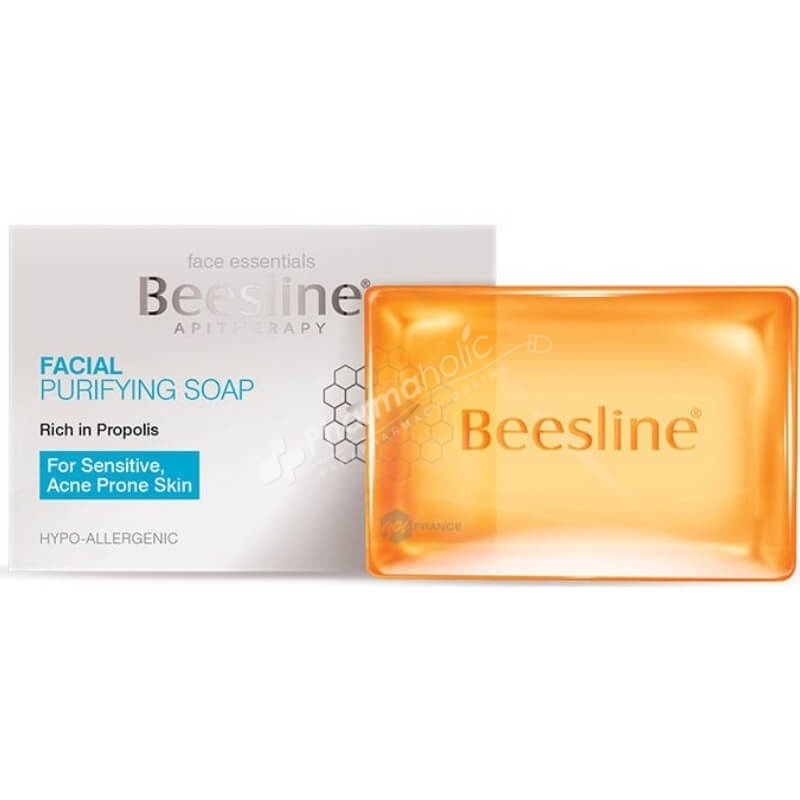 Beesline Facial Purifying Soap cleanses sensitive & acne-prone skin. Its anti-microbial, balancing & soothing properties from natural extracts reduce & prevent breakouts. A bar that gently cleanses sensitive & acne-prone skin. Its anti-microbial, balancing & soothing properties from natural extracts reduce & prevent breakouts. Free from colourants, ethyl alcohol, parabens, perfume, petrochemicals, phthalates, silicones, sulfates and ingredients of animal origin (except bee by-products). THYME (Thymus Vulgaris) has shown to be more efficient in treating acne and dandruff than medicated creams and shampoos, according to recent studies. It provides antibacterial, antiseptic and soothing properties. It also has astringent qualities and reduces sebum secretions. Use 2x per day (morning & night). Lather and gently massage onto damp skin. Rinse with cool water & pat dry. Follow with Beesline's Pore Refining Toner. Vegetable Glycerin. Sodium Stearate. Sodium Cocoate (Coconut Oil Soap Base). PEG-7 Oleate. Sorbitol. Saccharum Officinarum (Sugar Cane). Aqua. Sodium Lactate. Maris Sal (Sea Salt). Salvia Officinalis (Sage) Leaf Extract. Thymus Vulgaris (Thyme) Leaf Extract. Mentha Piperita (Peppermint) Oil. Lavandula Angustifolia (Lavender) Bud Extract. Propolis. PEG-40 Hydrogenated Castor Oil. Eucalyptus Globulus Leaf Extract. Rosmarinus Officinalis (Rosemary) Leaf Extract. Eugenia Caryophyllus (Clove) Bud Extract. EDTA.